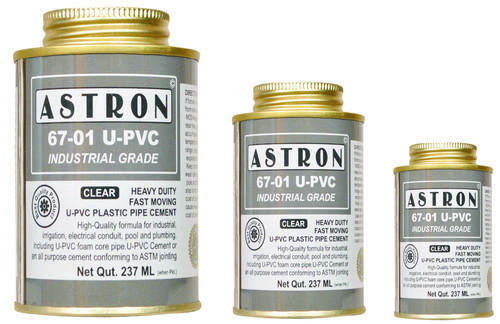 Incepted in the year 2011, at Ahmedabad (Gujarat, India), we, “Astron Industries”, are the renowned manufacturer and supplier of a comprehensive assortment of UPVC Plastic Pipe Cement and CPVC Adhesive. We are an ISO 9001:2008 certified company. These products are precisely processed by our technically sound professionals inculcating the most-advanced machines and the contemporary technology. Due to longer shelf life, high adhesive value and optimum quality, our offered assortment has gained huge demand among our clients. Apart from this, our industry experts hold proficiency in providing these products in a number of specifications as per their variegated requirements. We offer this supreme quality range of products as industry leading prices.